NEW YORK (August 5, 2008) – SHO Sports Presents, a nightly series featuring replays of thrilling SHOWTIME Sports telecasts from the network’s vast arsenal, will feature an incredible month of fights and features in August. (see full schedule attached). SHO Sports Presents airs every weeknight at 10 p.m. ET/PT on SHOWTIME® 2 and includes event telecasts from the flagship franchise SHOWTIME CHAMPIONSHIP BOXING, the newest sports television phenomenon EliteXC, as well as both prospect-oriented series ShoXC: Elite Challenger Series and the acclaimed ShoBox: The New Generation. You don’t have to wait for the heavyweight showdown between Sam Peter and Vitali Klitschko on Oct. 11 to see the “Nigerian Nightmare” in action. Tune in on Aug. 28 to see the wild fight between Peter and Jameel McCline that Peter won despite being knocked down three times in two rounds. Tune in for highlights of two of the best light heavyweights in the world, Antonio Tarver and Chad Dawson. Tarver and Dawson have been on a collision course for the past year while the two have dominated opponents in the light heavyweight division. To preview their highly anticipated showdown, also on Oct. 11, SHO Sports Presents will air championship battles featuring Tarver vs. Clinton Woods/Dawson vs. Glen Johnson on Aug. 27 (9:30 p.m. start time), among others. The explosive rematch between Robbie Lawler and Scott Smith for the EliteXC middleweight title originally aired live on CBS. Catch the encore on SHO2 August 14. Some of MMA pioneer Frank Shamrock’s most recent bouts will be featured throughout August. See Shamrock dismantle Phil Baroni on Aug. 12 (9:45 p.m. start time) followed by his instant classic battle with Cung Le the next night (9:50 p.m. start time). Plus, the inaugural EliteXC event and SHOWTIME debut from Feb. 2007 featuring Shamrock vs. Renzo Gracie will air on Aug. 29 (9:30 p.m. start time). SHOWTIME® 2 is the network’s primary multiplex channel. 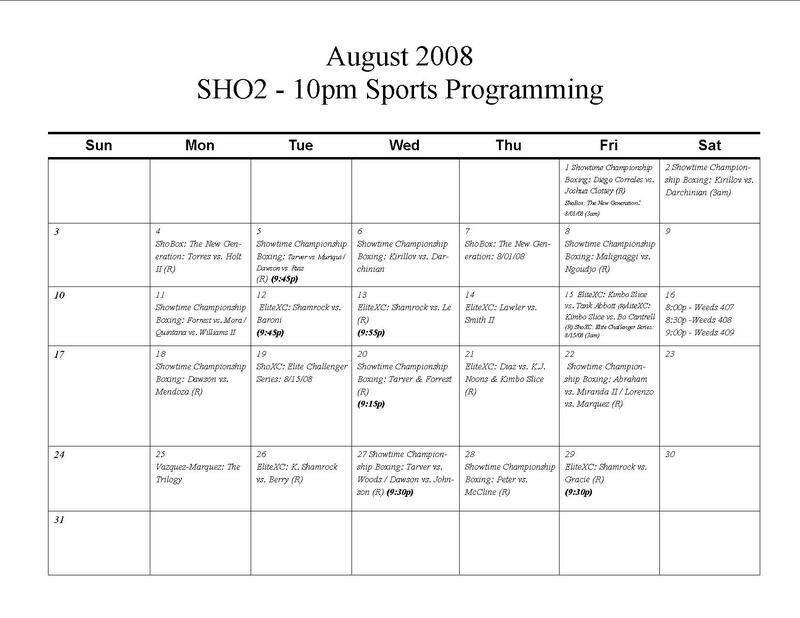 SHO Sports Presents has been airing weeknights since Nov. 3, 2007, when it premiered with a replay of SHOWTIME CHAMPIONSHIP BOXING: Rocky Juarez vs. Jason Pires from Feb. 1, 2003. In March 1986, SHOWTIME CHAMPIONSHIP BOXING was born when “Marvelous” Marvin Hagler defeated John “The Beast” Mugabi in a spectacular and unforgettable 11th-round knockout in Las Vegas. Since that time, the network has aired some of the most historic and significant events in the sport’s long history. Since its inception in July 2001, the critically acclaimed SHOWTIME boxing series, ShoBox: The New Generation has featured young, talented fighters matched tough. The ShoBox philosophy is to televise crowd-pleasing and competitive fights while providing a proving ground for willing prospects determined to fight for a world title. The growing list of fighters who have appeared on ShoBox and advanced to garner world titles includes Leonard Dorin, Scott Harrison, Juan Diaz, Jeff Lacy, Rick Hatton, Joan Guzman, Juan Urango, David Diaz, Robert Guerrero and Kelly Pavlik. ProElite Inc., the parent company of EliteXC, delivers the most exciting entertainment experience in the world of mixed martial arts (MMA) with live arena-based entertainment events, network television programming on CBS Television Network, cable television programming on Showtime Networks Inc., and community-driven interactive broadband entertainment via the Internet. ProElite embraces MMA on the highest levels of honor, integrity, discipline and self-esteem, all the while remaining inclusive for fighters, fans and schools. ProElite’s live fight division, EliteXC, delivers spectacular live MMA fight events that showcase the world’s top fighters. For the complete July schedule of SHO Sports Presents see attached. For more information on SHOWTIME Sports, including exclusive behind-the-scenes video, photo galleries and complete telecast information, please visit http://www.SHO.com/Sports.